For the 2500th Botany Photo of the Day entry, I thought I’d return to a favourite species, vine maple. Acer circinatum has the most number of individual entries on BPotD, which you can revisit by clicking on the Sapindaceae tag above (or just follow the link). I’ve updated the previous entries for vine maple, which now means I’m done 17.5% of that monumental task overall. This photograph was taken during our recent expedition to southwest Oregon and northwest California. A high-pressure system trapped the smoke and ash from the large forest fires in California and nearby states, lowering air quality everywhere we traveled. No relief was to be had seaside, where one would expect breezes from the ocean to provide some respite. One small positive of the smoke was that it provided diffuse light for photographs, akin to fog. The activities of collecting didn’t give me “quiet photographic time” that often. This was one occasion where I was able to spend time composing and waiting for breezes to settle, while my traveling companions went for a short hike to observe the redwoods (no permit here, so no collecting–just enjoying). The coast redwoods (Sequoia sempervirens) in the background were easily more than 3m (10ft.) in diameter, though their relative size is diminished with the telephoto lens. That’s why I included a small portion of one on the left side of the image, to better give a sense of the scale between the redwoods and the vine maple. The mosses dressing the maple are, I think, Antitrichia curtipendula (aka hanging wing-moss)–but bryologist readers can please correct me if I’m wrong. I’m basing that assumption on the fact that Antitrichia curtipendula is an effective secondary epiphytic colonizer of vine maples as they age. 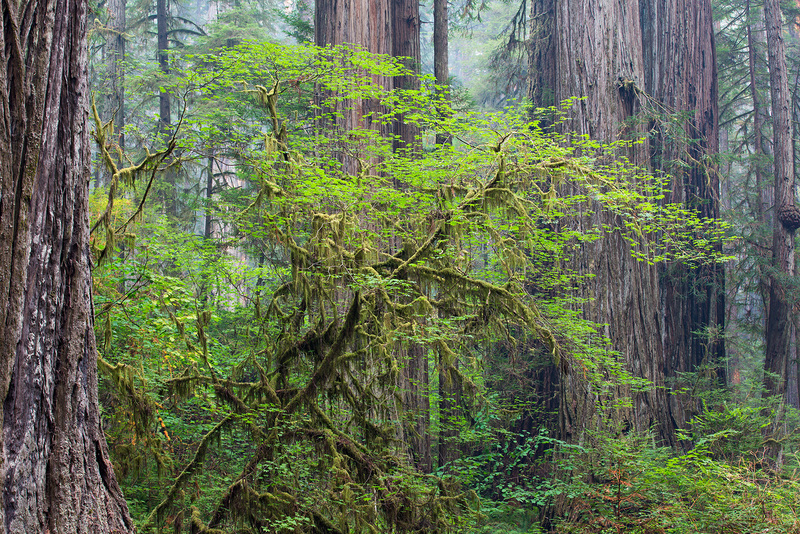 Acer circinatum is native from southwestern British Columbia to northwestern California, where it occupies “wet to mesic closed and open forests and streamsides in the lowland and montane zones”. These are a favorite. I once asked my wife, “if we were to move some place else, what plants would you want to try to grow to remind you of home?” Her vine maple was her first answer. They have the best fall color of any species native to Cascadia, where almost every other deciduous tree turns a beautiful shade somewhere in the yellow spectrum. Glad there was some upside to the smoke. It was hard on me and worse on my wife. Sore throat and an ache from the upper portion of my lungs were routine. I’m glad that’s past, at least for this year. A very favorite of mine for being the only bright autumn red to be found here in the PNW. I’ve heard that the loggers aren’t particularly fond of it though. A common question is, does it climb? The common name implies this, in fact, I once saw them for sale as Vining Maples at an IGA. How did get the word VINE attached to it? I’ve looked in a number of references (e.g., Trees and Shrubs Online), but no specific mention of the origin of the common name. Douglas remembers reading that it is a reference to the general sinuous and twisting nature of the branches. References mention that it can sometimes arch and touch the ground, whereupon it will layer itself (apparently the only maple to do so). It wasn’t about climbing, as I understand it, but more (as is indicated in Daniel’s answer), how the lower branches will grown to the ground, then grow along the ground like vines do. I’ve been fascinated with vine maples since reading about them in every mystery novel about “Alpine, Washington,” by Mary Daheim. I’ve been looking for photos, but this is the most intriguing that I’ve seen. Well, the moss helps. I too want to know about the “vine” part. 2500th!! Now that is something to celebrate. Many thanks for sharing beauty and knowledge. What a lovely picture! I saved it for my desktop, hope it is much larger than what I see. When I click on the picture it is the same size as on the page. Mazel tov for this landmark and thank you!! Thanks Harry, that’s discussed in some of the earlier entries (which are almost all about autumn colour)!